A permanent display fixture shows a long-term commitment to consumer engagement by the brand. It must be visually attractive, highly durable, using materials and construction that enhance the brand and perceived value of the merchandise. 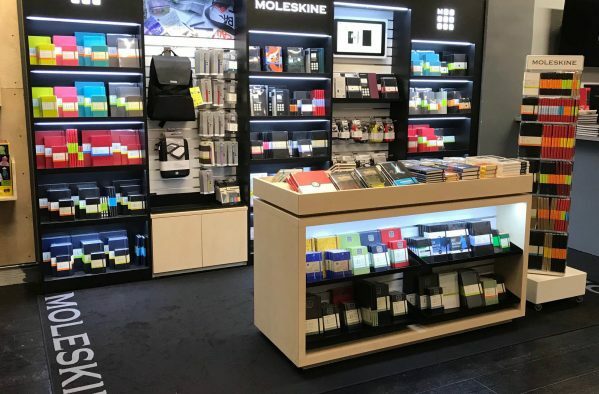 Moleskine, famous as the maker of Hemingway’s writing journals has evolved into an international lifestyle brand known for its high quality materials, distinctive design, and products for self-expression. For their flagship locations and platinum retail partners, we produce their ‘Atelier’ fixtures, individually built and customized for each retail venue. Ranging from merchandising islands to complete shop-within-shop environments, they’re built with laminates and veneers, sleek aluminum slat wall sections, cantilevered shelving, product storage, sophisticated lighting, motion activated multimedia screens and dimensional logo and lettering. These beautiful installations appeal to and engage the distinctive brand lifestyle of self-expression in all of us. 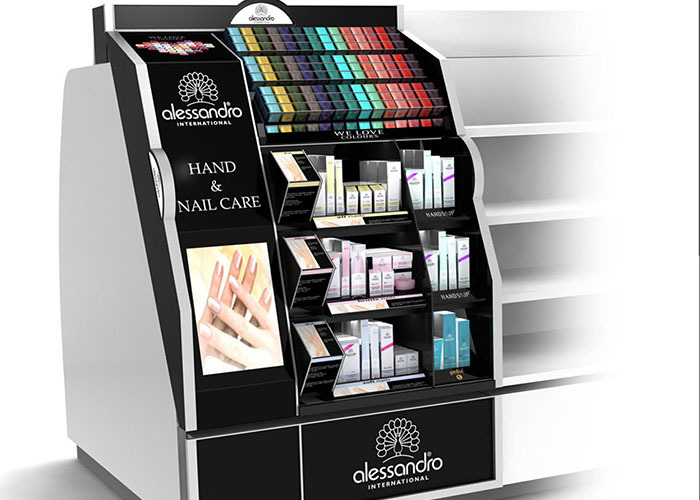 An established European beauty brand for hand, nail and foot care products was introducing their products in Sephora, the upscale specialty retailer. Educating consumers about the product treatments, their benefits and instructions for use called for extensive explanation for each category in an informative, fun, and engaging way. We conceived the rotating blocks to deliver 4X the messaging at the side of each shelf category and color coded graphics for product navigation below it. Large graphic areas running top to bottom on the left of the fixture and multiple logo placements framed the product area, joining the brand and its product families together in the consumer’s eye. 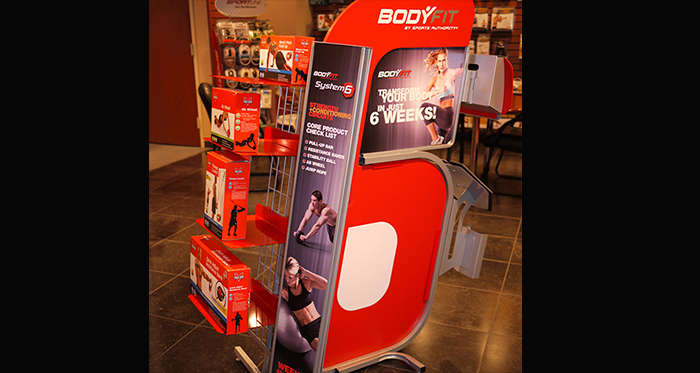 To drive sales of their OEM branded fitness equipment, the specialty retailer and equipment manufacturer wanted us to create an ‘exercise destination’ display fixture for the product line to accompany their fitness regimen System 6. We developed a 6-prong attack, made of lightweight aluminum for portability, wire grid for shelf and hook placement versatility, steel literature holder and page by page catalogue and printed plastic panels for durability. An LCD screen delivered pre-Peleton like exercise content, and the silk-screened PVC panel produced the iconic System 6 visual branding, affectionately named ‘Big Red’.